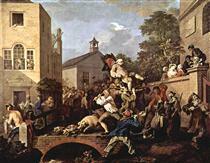 William Hogarth FRSA (/ˈhoʊɡɑːrθ/; 10 November 1697 – 26 October 1764) was an English painter, printmaker, pictorial satirist, social critic, and editorial cartoonist. 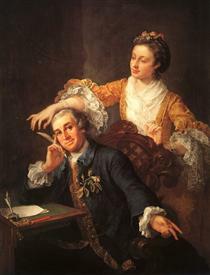 His work ranged from realistic portraiture to comic strip-like series of pictures called "modern moral subjects", perhaps best known being his moral series A Harlot's Progress, A Rake's Progress and Marriage A-la-Mode. 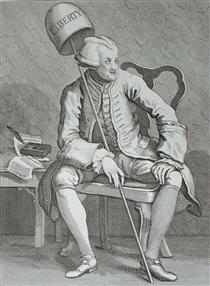 Knowledge of his work is so pervasive that satirical political illustrations in this style are often referred to as "Hogarthian". 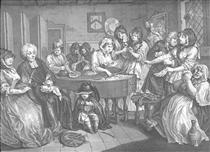 Hogarth was born in London to a poor middle-class family. 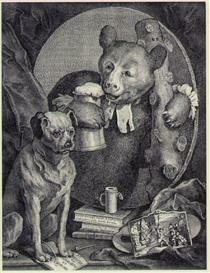 In his youth he took up an apprenticeship where he specialised in engraving. 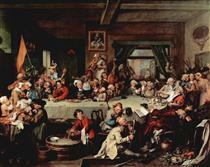 His father underwent periods of mixed fortune, and was at one time imprisoned in lieu of outstanding debts; an event that is thought to have informed William's paintings and prints with a hard edge. 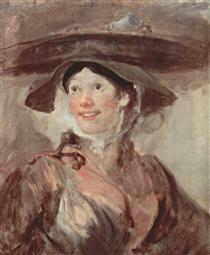 Influenced by French and Italian painting and engraving, Hogarth's works are mostly satirical caricatures, sometimes bawdily sexual, mostly of the first rank of realistic portraiture. They became widely popular and mass-produced via prints in his lifetime, and he was by far the most significant English artist of his generation. 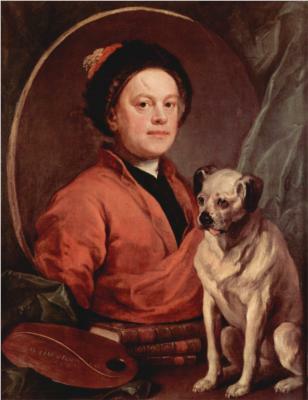 William Hogarth was born at Bartholomew Close in London to Richard Hogarth, a poor Latin school teacher and textbook writer, and Anne Gibbons. In his youth he was apprenticed to the engraver Ellis Gamble in Leicester Fields, where he learned to engrave trade cards and similar products. 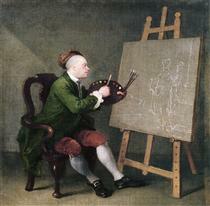 Young Hogarth also took a lively interest in the street life of the metropolis and the London fairs, and amused himself by sketching the characters he saw. Around the same time, his father, who had opened an unsuccessful Latin-speaking coffee house at St John's Gate, was imprisoned for debt in Fleet Prison for five years. 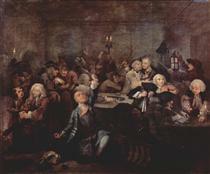 Hogarth never spoke of his father's imprisonment. 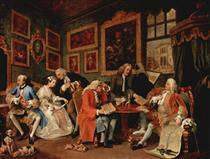 Hogarth became a member of the Rose and Crown Club, with Peter Tillemans, George Vertue, Michael Dahl, and other artists and connoisseurs. 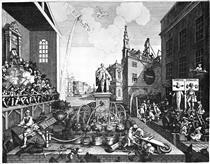 By April 1720, Hogarth was an engraver in his own right, at first engraving coats of arms, shop bills, and designing plates for booksellers. 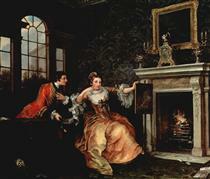 In 1727, he was hired by Joshua Morris, a tapestry worker, to prepare a design for the Element of Earth. 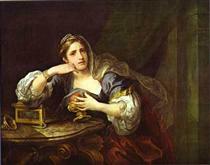 Morris heard that he was "an engraver, and no painter", and consequently declined the work when completed. 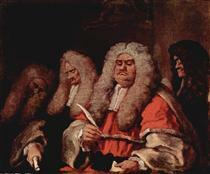 Hogarth accordingly sued him for the money in the Westminster Court, where the case was decided in his favour on 28 May 1728. 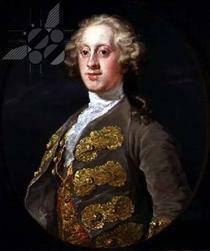 In 1757 he was appointed Serjeant Painter to the King. 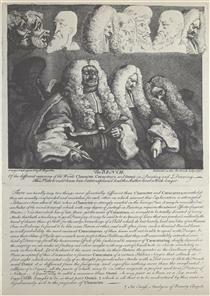 Early satirical works included an Emblematical Print on the South Sea Scheme (c.1721, published 1724), about the disastrous stock market crash of 1720 known as the South Sea Bubble, in which many English people lost a great deal of money. 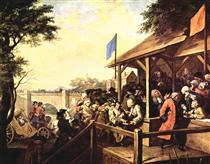 In the bottom left corner, he shows Protestant, Catholic, and Jewish figures gambling, while in the middle there is a huge machine, like a merry-go-round, which people are boarding. At the top is a goat, written below which is "Who'l Ride". 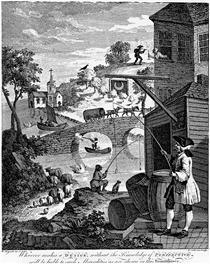 The people are scattered around the picture with a sense of disorder, while the progress of the well dressed people towards the ride in the middle shows the foolishness of the crowd in buying stock in the South Sea Company, which spent more time issuing stock than anything else. 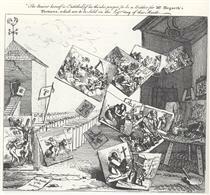 A Harlot's Progress, plate 6 William Hogarth ? 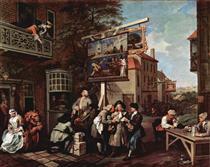 Satire on False Perspective William Hogarth ?